I wonder how many of our Readers realize that Accuphase offers a phono cartridges? All right, by of exaggeration – just one cartridge at the moment. Amplifiers, preamplifiers, digital players – that's what everybody associates with this Japanese brand. No more than 2-3 months ago I saw on Polish Distributor's webpage an information about AC-5 cartridge, so it wasn't a real surprise for me when I received this cartridge for a review. I have to admit I was damn happy about it. First of all, unfortunately for a vinyl fan like myself, it happens very seldom that distributors deliver some cartridge for a review. Secondly – Accuphase brand name is some kind of warranty that whatever carries it delivers great performance. And last but not least it is a direct competitor to my favorite AirTight PC-3. AirTight is my favorite but I couldn't really compare it to other competitors from same price level. At least so far. Let's go back to cartridges in Accuphase's portfolio. The first one was introduced to the market in 1979 and it was called AC-1. Then there were two more – AC-2 (1980) and AC-3 (1983). None of them is produced anymore. All of them were designed by Hisayoshi Nakatsuka – yes, the owner of ZYX, and the guy responsible for some Monster Cable products. The AC1 and AC2 looked identical, but there were slight technical specification differences. The AC3 did not possess the elegant gold body, but instead had a smaller black one. The two earlier versions of the cartridge used an aluminum/magnesium cantilever that was reinforced with a beryllium rod. The AC3 had a boron cantilever with the same type of beryllium rod treatment. However the cantilever was smaller, and had a lower moving mass. 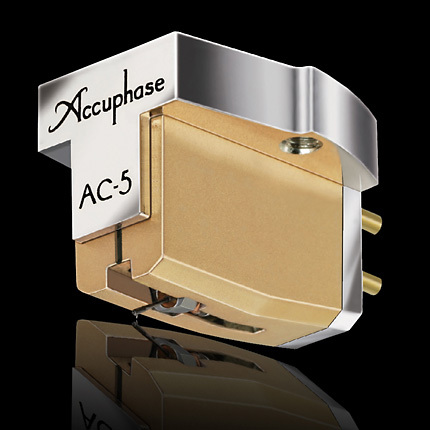 AC-5 is the latest incarnation of those cartridges – pewter housing with manual mirror finish is gold plated again, and this time cantilever is made of solid amorphous boron. Obviously it's a mixture of tradition and some modern technology. 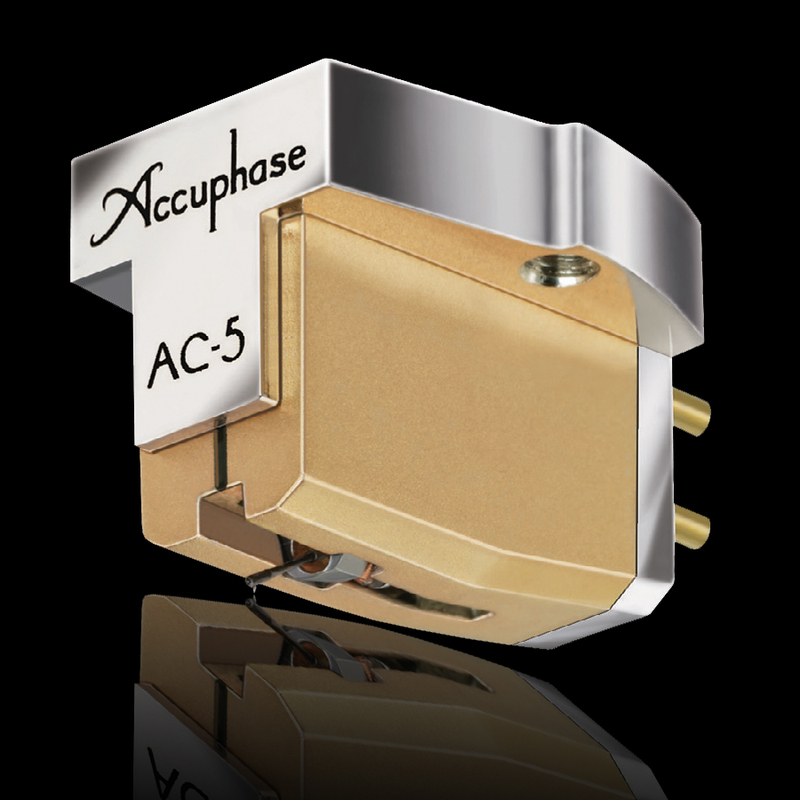 It's hard to tell why Accuphase decided to launch a new cartridge after 25 years from the last one – maybe because they also added to their range an independent phonostage C-27 (before phonostages were always integrated inside preamplifiers), or maybe they managed to create something special and simply had to share it with their customers. I haven't found any information concerning its designer – is it again Hisayoshi Nakatsuka, or somebody else this time? 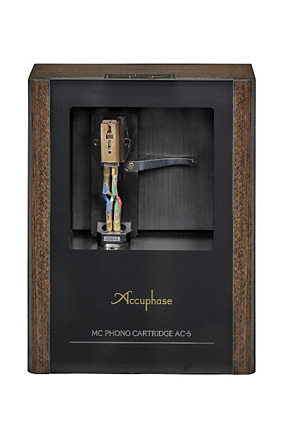 It is the only one cartridge in present range of Accuphase – the top achievement, no compromise, budget versions – just the very best they know how to make. During the test I used two turntables – Transrotor Super Seven La Roccia with SME arm and my own Michell Gyro SE with fabulous TransFi Terminator air bearing arm (exactly same rig that created such a wonderful synergy with AirTight's PC-3). I also used three different phonostages – my own ESELabs Nibiru, but also VTL TP-2.5, and during last couple of days also Array Audio Obsydian PH-2. So this time I dare to say that test was truly versatile. The only doubt I still have is if the cartridge was fully broken in as I received a brand new piece and according to Distributor it requires at least 100 hours to show its full potential (I most likely played around 100 records but it doesn't make 100 hours). I started to listen with Transrotor and Nibiru. This setup, regardless of cartridge used (the one delivered with turntable, Koetsu Black, or AC-5) always presented similar sonic signature implied by German mass-loader. I call this kind of sound „massive”, in the most positive meaning of this word. Sound is huge, powerful, with strong bass foundation, that makes pipe organ sound real, and allows a symphonic orchestra to overwhelm listener with its dynamics. There is a great resolution and bass tones differentiation, also micro-dynamics is outstanding. I will not really comment on the cartridge delivered with Transrotor table as it is of a good quality but it's not the same level of performance as the La Roccia. Differences between Accuphase and Koetsu were quite significant, which was to be expected considering price difference. Comparing those two I must say that Koetsu offers bit warmer sound, with rich, smooth midrange and slight but audible roll-off at both frequency extremes. To be honest I never doubted that there was this warmth in the midrange but only direct comparison with AC-5 (and also with PC-3) proved clearly that bass could be more tight, and the top more open and vibrant. 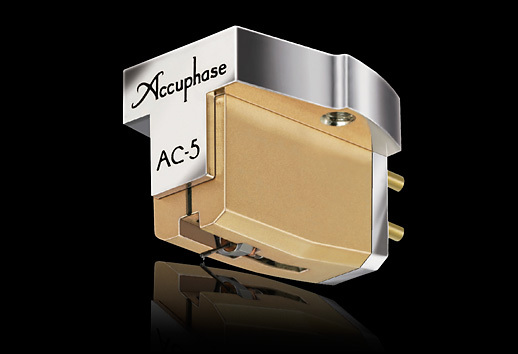 Accuphase offers some warmth in its midrange too which becomes even more obvious when you compare it to AirTight, which happens to be the most neutral sounding cartridge of them all. 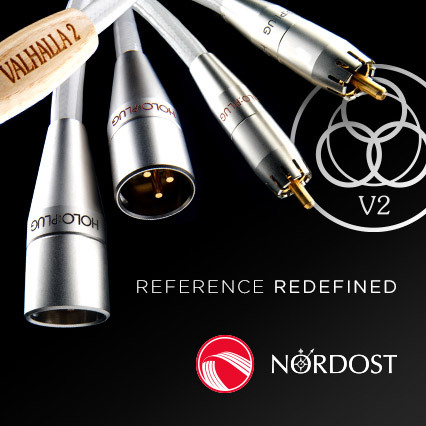 I want to repeat one more time that when I test high-end devices, each time I use descriptions like „more”, „less” or any other gradations you have to remember that you need to take it more lightly than same description used for hi-fi devices. When it comes to high-end products differences are much, much smaller but I have to use same word as in any review. So my „more neutral sound of AirTight” means only that there was no this subtle warmth I heard when Accuphase played music. One of my „obligatory” records for all tests of turntables, cartridges and phonostages is Ray Brown's „Soular energy”. Ray's bass as presented by AC-5 mounted on Transrotor was one of the best I ever heard – well extended, amazingly differentiated, colorful, with a lot of „wood” in the sound, and with fingers sliding along strings. Although I couldn't make head-to-head comparison with AirTight nor have I heard it on the same deck I'm still going to try to point out some differences. Basically it's the same top level performance, but with some small differences. Accu offered well extended, full-bodied bass whereas AirTight, while well extended, preferred speed and tightness. Midrange of the latter sounded bit more neutral comparing to Accuphase's, which was clearest when listening to vocal recordings. Accu delivered voice of Patricia Barber with bit more warmth, which made it sound bit darker. It went along with real character of Patricia's voice – low-pitched, bit rough – generally it sounded bit more real. AC-5 presented vocalist also bit closer to the listener than PC-3 did, and the whole soundstage followed. It felt like Patricia took one step forward from her „standard” location whereas with AirTight on board she delivered her performance from behind speakers line. Since I already started with soundstage – AC-5 delivers very wide and (I thought) also deep soundstage. “I thought” as everything is relative – it was deep comparing to what Transrotor’s cartridge delivered, even to what Koetsu delivered, but comparing to AirTight's performance in this aspect it didn't seem so deep anymore.